Please read How does a mouthpiece work and How does a mouthpiece relate to the horn?? before starting to select one for your horn. Once you understand my philosophy of mouthpiece function, you will be ready to match one to your instrument. If you are trying mouthpieces, you probably have access to a set of 12 that I send out for this purpose. These 12 mouthpieces (A5 thru D7) satisfy 95% instruments – though your trombone may conceivably work better with a power level lower than 5 and higher than 7. The following exercises are designed to focus your awareness upon the interaction and relationship of a mouthpiece with a trombone. Each mouthpiece will make the instrument play, respond, sound and feel differently! 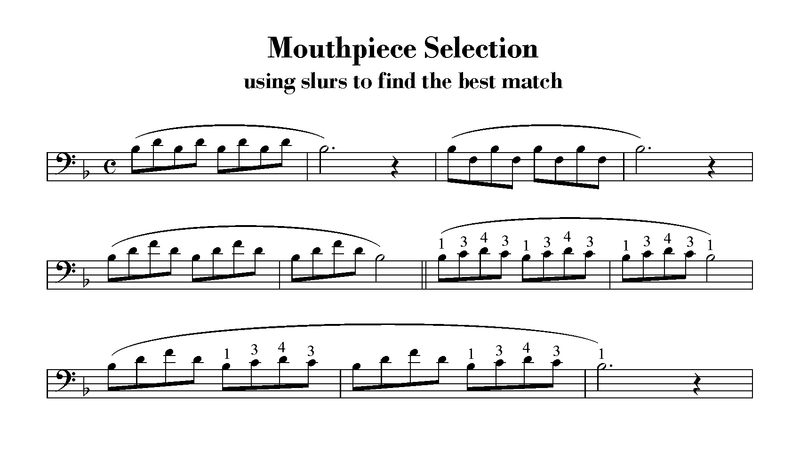 These instructions will steer you toward the optimal match for your instrument. Start with a Hartman mouthpiece from any SERIES (A, B, C or D) with a standard power level ( 5, 6 or 7) – I would suggest starting with A6. Notice how it feels to slur – both in first position and when you move back and forth between 1st, 3rd and 4th positions. Remember that when you are slurring between Bb/C/D, you are moving between the same harmonics (partials) as when you are slurring between Bb/D/F. Ideally, it should feel the same to do both slurs. Next, do these exercises using B6, then C6 and finally D6. One of these four mouthpieces will be easier and more comfortable to play than the rest. The others will feel ‘sticky’ and less predictable between the partials. This is because of the venturi effect discussed in How does a mouthpiece work. Go back and play the first four mouthpieces again playing the tonguing patterns. The mouthpiece that is best for these patterns should be the same as for the slurring patterns. but, if you are still not sure, that’s OK, let’s move forward. Step #2: Now that you’ve narrowed down which SERIES (A, B, C or D) matches your trombone, try a mouthpiece in the same SERIES with a power level either more or less than the one you just played, i.e., if you think that C6 is the best so far, then try C5 and C7. Here are some things to pay attention to as you compare the mouthpieces. You will notice that the note is slower to speak with the lower power mouthpieces and quicker to speak with the higher power mouthpieces. This is true for both tonguing and slurring. Also, as the power level grows, 4, 5, 6, 7… the general sound you produce becomes more focused, directional and colorful. In reverse, as you play mouthpieces of progressively less power, 7, 6, 5, 4 … the tone gets more open and transparent. There is something appealing about all of these timbres! BUT…be wary of both mouthpieces that overdrive or underdrive the horn – they will be harder to play and you will miss more notes as a result! Just to make sure you are on the right track, go back and try some of the other SERIES mouthpieces. After you done this a bit, you’ll find that it is very clear which is the correct SERIES. Finding the appropriate power level is more subjective but is also relatively straight forward once you are familiar with the process. Articulation, slurring, tonguing, high and low range are all made easier by having the correct match between your trombone and the mouthpiece. It’s a Win/Win situation! The ideal match is achieved when you can blow comfortably at all times…while slurring, while tonguing, loud/soft and on sustained notes. This condition is obviously the easiest manner of playing, plus it reveals the true characteristics of your instrument. Step #3: Go back and play the mouthpiece that you used to play… I’ll bet that it is a lot more difficult to play than your new Hartman mouthpiece! you may be trying to get your instrument to do something it isn’t really set up to do.